Good to have regular cup holder size instead of tea cup ones. Worth the upgrade for earlier Countryman's. I got this light for my R53 Cooper S and the plug in for the harness did not fit the harness in the car. I needed to modify the circuit board and change the wiring harness in my car so that it would fit. Synopsis: No one is left out with this selection of key accessories! Wow! Choices, choices, and more choices! This key chain selection is extensive! 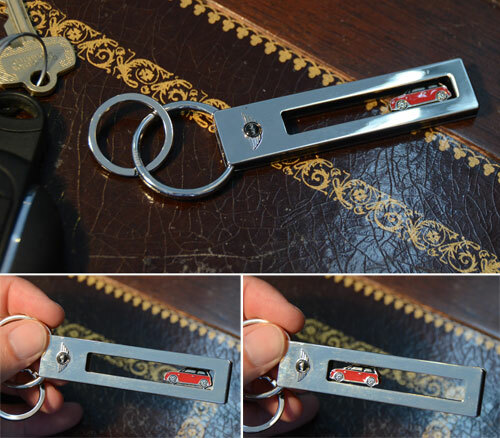 We offer key chains tailored to specific type of MINI - Cooper, Cooper S, or JCW. We have styles in chrome, darkened chrome, leather, colors, patterns, etc. There are miniature MINI replicas, lockets, and bulldogs. OH MY! I am running out of breath! Check out all the options for yourself by clicking here!